Jan Molam : Saksiam Petchompoo - Thai Funk and Molam! HLP245 full album! Saksiam Petchompoo - Thai Funk and Molam! HLP245 full album! 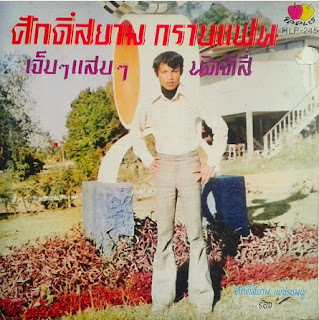 Saksiam Petchompoo should be well known, his songs are featured on the "Sound of Siam" Compilations and on the "Theppabutr Productions" Sampler... his music is more soul than funk, with razor sharp saxophones and a driving molam beat. Just check the first 2 songs, Saksiam Grab Faen (Saksiam salutes his fans) and Saksiam doen glorn (Saksiam spins a tale) and you will be hooked! This album "Saksiam Grab Faen" is a very rare compilation of impossible to find 7inches, and probably the best Saksiam LP ever. Enjoy! wow. can't wait to hear. thank you!